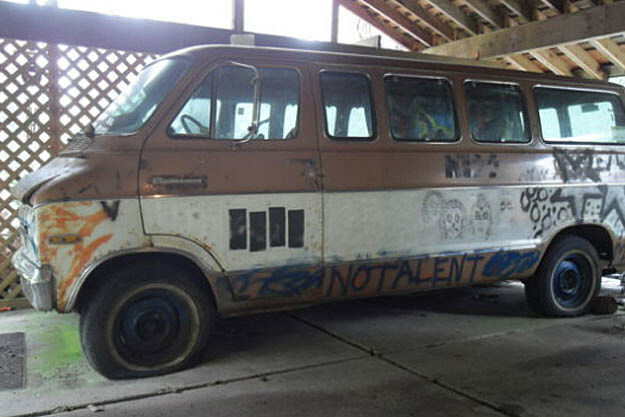 The Melvan is for sale, and if you're a collector of all things Nirvana its something you want. You see, the van was used by the early grunge group The Melvins. The 1972 Dodge Sportsman Royal Van is covered in a variety of graffiti. However the most noticeable part of the 'art work', is a picture of the band KISS. That picture was drawn by the late Kurt Cobain. How legit is the claim? Well this article has a picture of Leland Cobain (Kurt's grandfather) standing next to the van. He says Kurt drew the picture with Sharpies he stole from a local grocery store. I should also mention that Leland Cobain still answers every piece of fan mail he receives with a personal handwritten note. Ben Berg is the owner of the van and received it in 1992 as a 16th birthday present. It is now broken down and Berg is out of money. So he put the van on eBay hoping to meet the reserve of $100,000. However that reserve was not met (by a penny), and Berg is hoping to some how unload the van to help himself out of a cash bind.